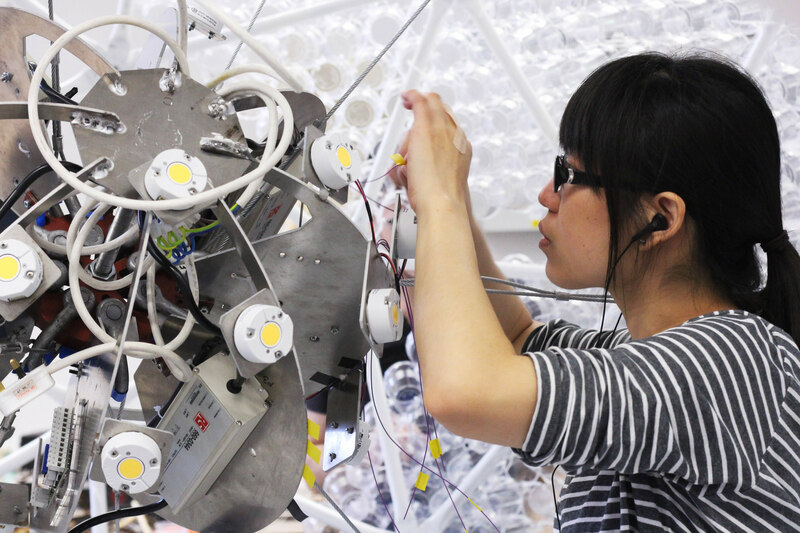 Bank of America Merrill Lynch and their long-standing arts partner Create London commissioned the Interactive Architecture Lab to build an Installation that reflects on our personal and collective waste streams. 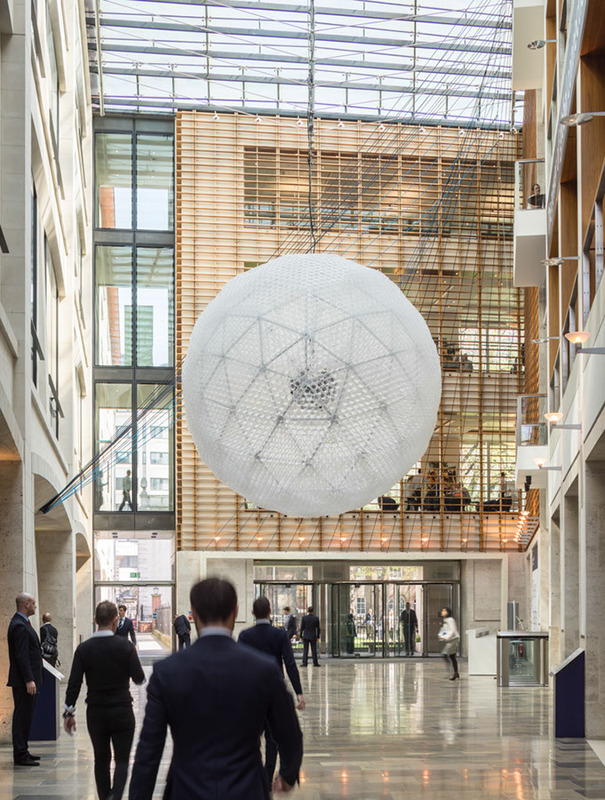 Suspended at their London corporate headquarters at No. 2 King Edward Street, the artwork was launched for EarthDay http://www.earthday.org/ 2015. Wrapped in 8000 plastic cups Bank of America Merrill Lynch has committed to using this many less cups during the six-weeks of its install as part of a bank-wide initiative to educate and inspire employees to recycle at work as part of the bank’s commitment to environmental sustainability. The afterlife of the Installation was also an important factor in the design. All the elements that make up the work have planned further uses. 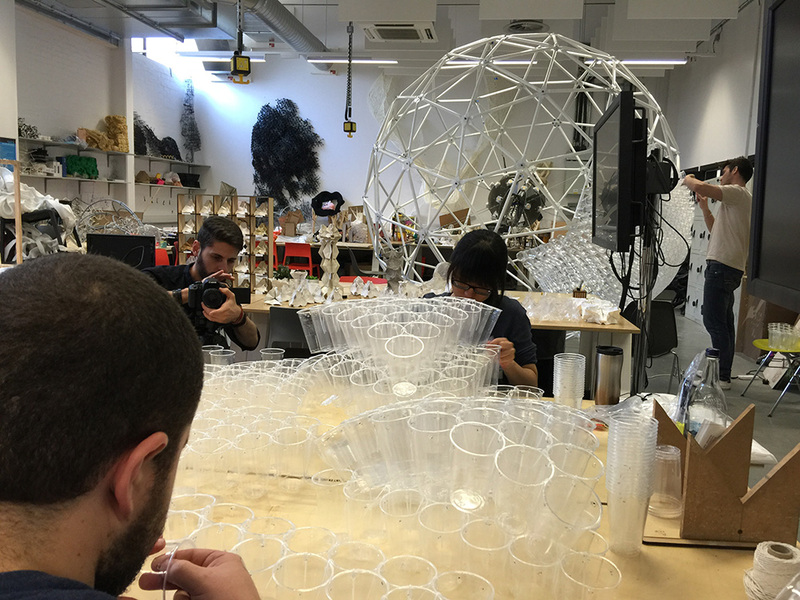 The cups will be used in workshops with local school children to discuss waste and build their own art works with the support of Create London and the Interactive Architecture Lab. 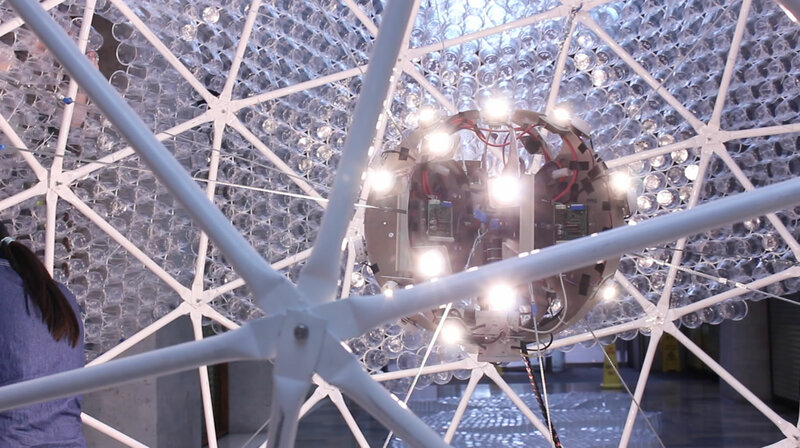 The Structure will be used at the Bartlett School of Architecture on the reEarth project and the lighting sponsored by Xicato will be incorporated into ongoing research at UCL on mobile controlled low energy lighting. Installation Contractors: Talina Builders Ltd. 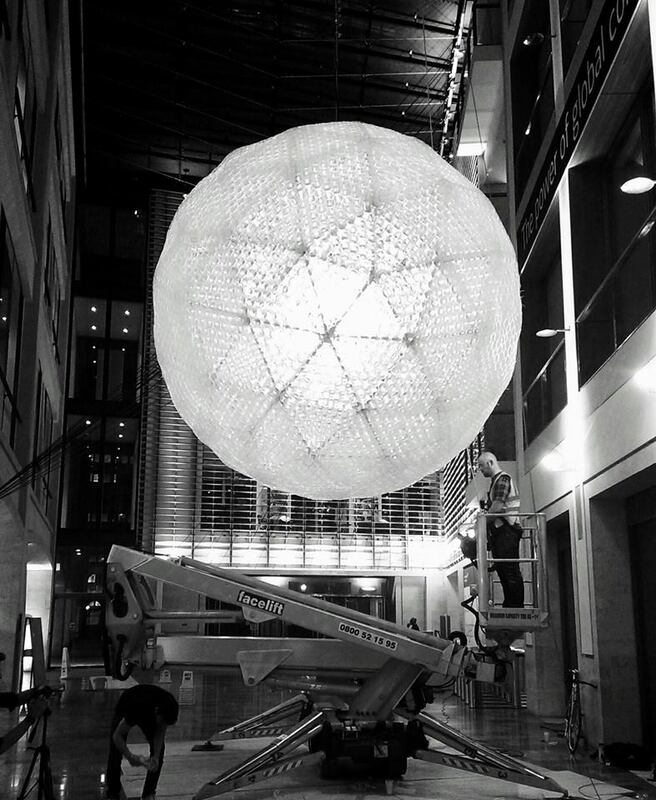 The Making of myCup: This 3 metre diameter installation consists of multiple interdependent layers forming one rigid structure. 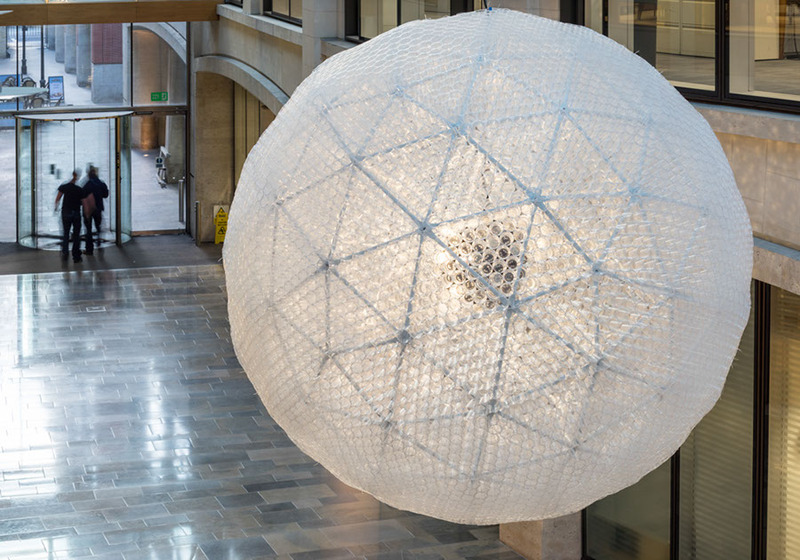 The outermost layer consists of inter-weaved plastic cups skin which is supported and connected to a light-weight aluminium geodesic sphere which in turn houses a digitally fabricated internal core. 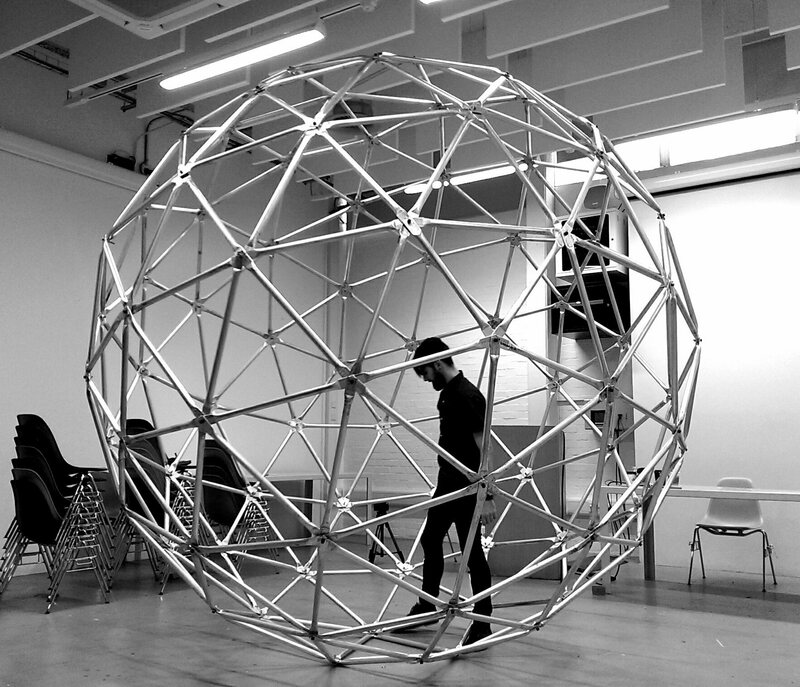 This internal core has a dual function; it is braced to the structure at the centre of the geometry increasing its rigidity and providing a central point of suspension preventing the geodesic structure from deforming when suspended in position. In addition to the structural stability the central core features a system of 8 fins providing fixing points for 29 high brightness and individually addressed LEDs’. 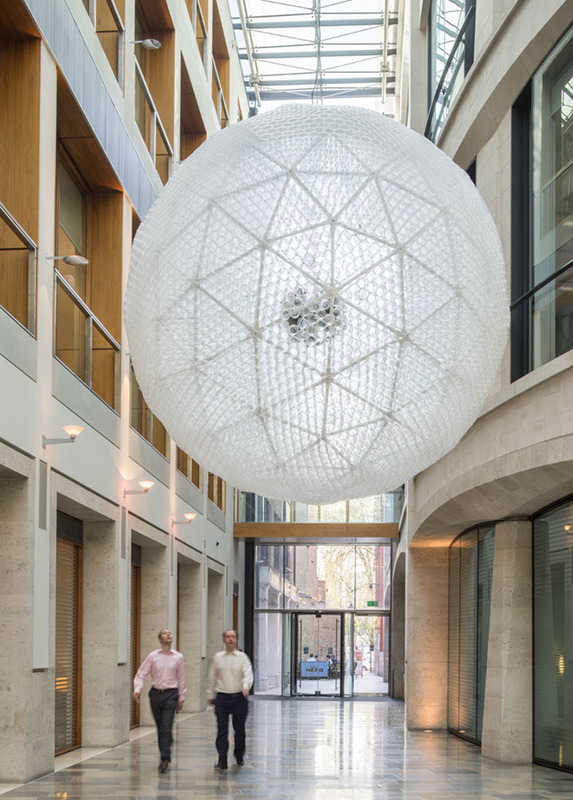 The lighting core at the centre of the geodesic structure illuminates the surrounding space through the filtering layer of the translucent outer layer created by the plastic cups. 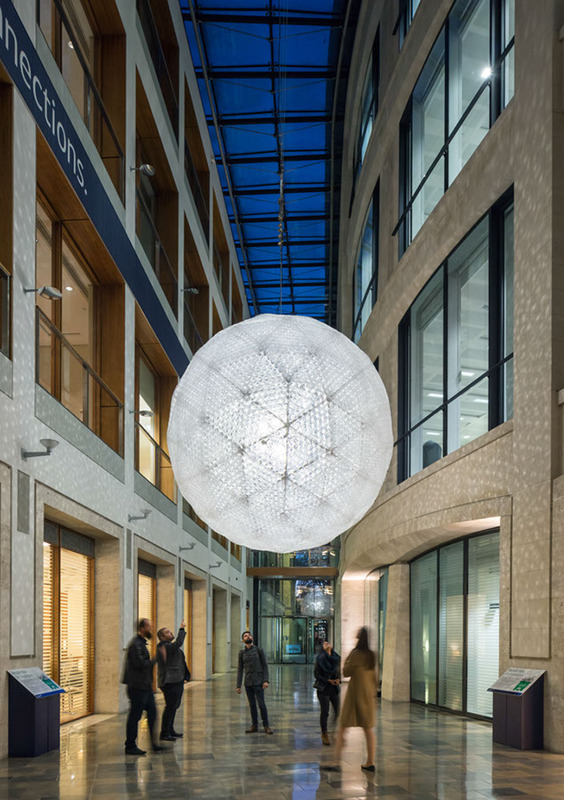 The exact geometric positioning of the LEDs creates an equally spaced arrangement of lights that reveal the inner structure through the glowing skin of the sphere using a multiplicity of dynamic lighting behaviours. The richness of visual sensations offered by the interplay of light, darkness and reflections both inside the sphere and in the surrounding environment can be created by the visitors who have a direct role in its behaviour through a 3D, contextual, interactive-platform – a mobile web based interface through a local ad-hoc wifi connection.